We're in the beautiful Dolomites and the weather forecast is awful - what to do? Martin’s last day, and we had hoped to do Stelvio. But the long drive and terrible forecast meant that we decided to be just slightly less ambitious. 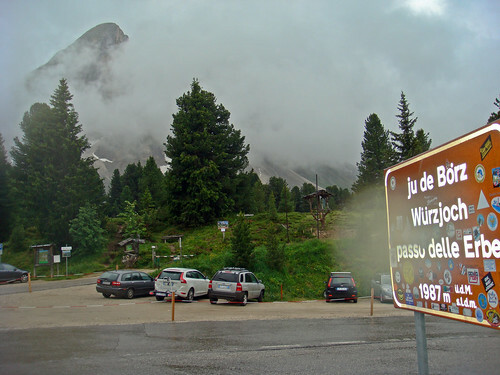 Passo delle Erbe is a big, beautiful climb …. at least we have been told it is beautiful …. but we were rained on throughout and fog/clouds blocked the big views. 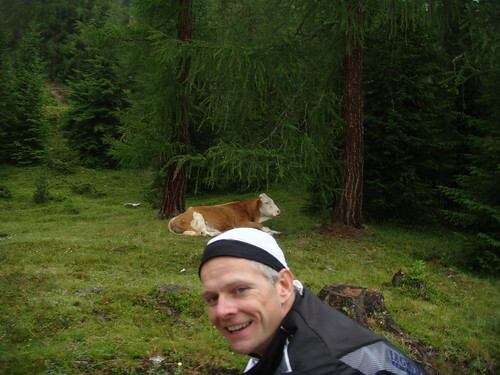 At just under 2000m it’s a serious mountain – hard work. Martin had his climbing legs and absolutely outrode me today …. and patiently waited as I descended like a (wise?) coward. After adding 5 layers, we survived the descent and battled the long, slightly uphill return. The last 5 kms it absolutely dropped buckets … but at the lower altitude, we decided to remain cheerful (and drenched). But we had fun. I’ll post an elevation/grade chart when I get a chance …. but the climb is very variable … sometimes easy sometimes extremely steep. But a worthwhile addition to any visit …. especially if sunny. Will – this is one of the most beautiful climbs I’ve done – in a perfect sunshine on a car free Sunday. The views at the top are just very spectacular. Descending via St Andrea and then climbing from Lutsen again – very hard work, but the views at the top for the last 3.5 kms are – again – hardly comparable with anything. I found Sella Ronda loop beautiful, but -how shall I put it – too concentrated experience, almost overwhelming, whereas Wurtzenjoch on a sunny summer day – a perfection. Thanks for recommending it on your blog. 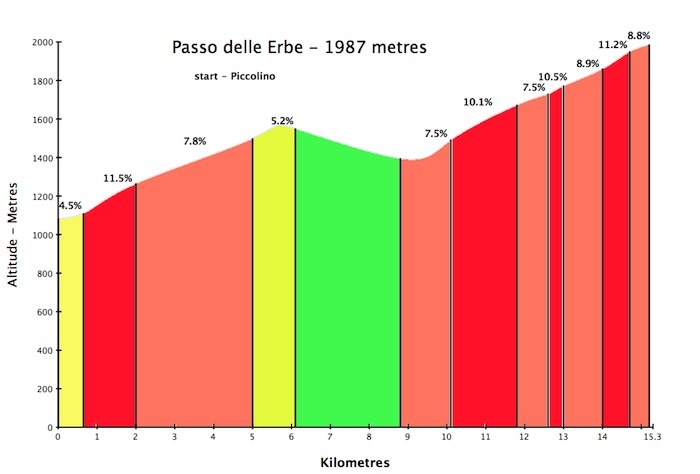 Passo Erbe is my favourite climb too. There are five aproaches. I prefer roads from Piccolino and from Val di Funes on opposite side. There is better asphalt and better vieuws than on road from Brixen. 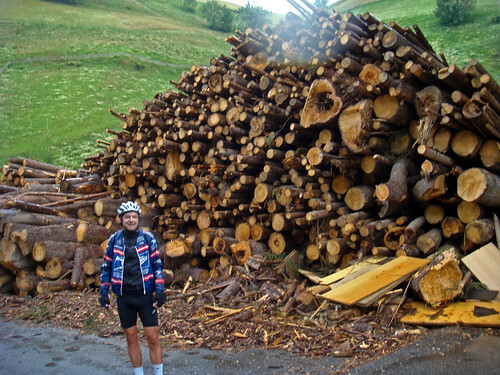 Minor road through Val di Luson is good too, but not well surfaced. Better cycle uphill. 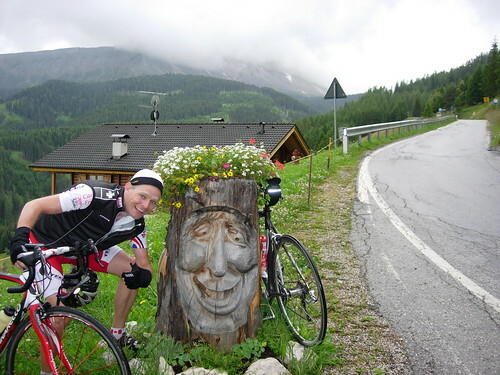 If you ride from Val Gardena try small road via St. Pietro, Lajen and Gudon. Very quiet and nice.